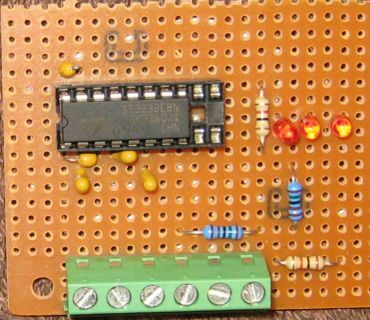 Install a 16-pin socket on a perfboard and attach the five capacitors as shown on the datasheet. The chip requires 3.3 volts in, and generates the high voltages using a charge pump. One chip provides two transmitters and two receivers, but you only need one each for most purposes. I installed screw terminals on mine for easy connection, and LEDs on the outputs of the MAX3232 chip. If I built another one, I would have multiple ground terminals to make it easier to connect everything. Connect the RS232 side of the converter to your PC serial port. [give pinout] USB serial adapters work fine. Connect power to the converter, go into Hyperterminal or Minicom on the PC, and connect to the COM port directly. Use 4800 baud, 8, N, 1, no flow control. Type a few characters and nothing should appear. Now bridge the CMOS IN and OUT lines on the converter, and type again. Your characters should echo. If this works, the converter is good. If you connect the phone through the level converter, you can interact with the AT command interface. When trying to send AT commands manually, this phone suffers from character loss. At first I thought the AT interface is just broken on the C168i, but it works fine if you send a continuous data stream. It has a very short timeout before it stops listening, so you have to type fast and continuously. This is probably excessive power management in the phone. The Tracker frequently gets no response to its first ATE0, but the second attempt works. Connecting the GPS to the level converter will display the NMEA strings. I used this to try out the GPS module. You can also use the level converter in reverse to interface an RS232-level GPS unit to the AVR microcontroller. I tried this with the Garmin ETrex Vista and the Tracker got a valid fix from it. Set the #define SERIAL_DEBUG in the Tracker source to enable debug output from PORTA7 (MCU pin 6.) Connect this pin through the level converter to the PC and start the microcontroller with debug firmware loaded. You should get a message "MACHINE STARTED IN DEBUG MODE" at 4800 baud. From there, the microcontroller will copy all phone interactions and responses to the PC. This is essential to debugging the phone interaction. You can also load the microcontroller with non-debug firmware and "tap" the phone or GPS lines with the level converter. This will get you only one side of the phone interaction, but debug firmware runs slower and might work when production firmware does not. To add a new command, add an entry to COMMAND_MATCH_PATTERN with the command and address of a new function. Add the function to handle the command and parse any options. This function will be called while the serial I/O is still running and the command is in the buffer, so you cannot send a message directly from this function. Parse your options into the PARSE_FIELDS area. To send a message, set the address of another function in COMMAND_PENDING. After the phone poll completes, your function will be called from MAIN and you can send a message. The MULTI_SEND functions send most messages. 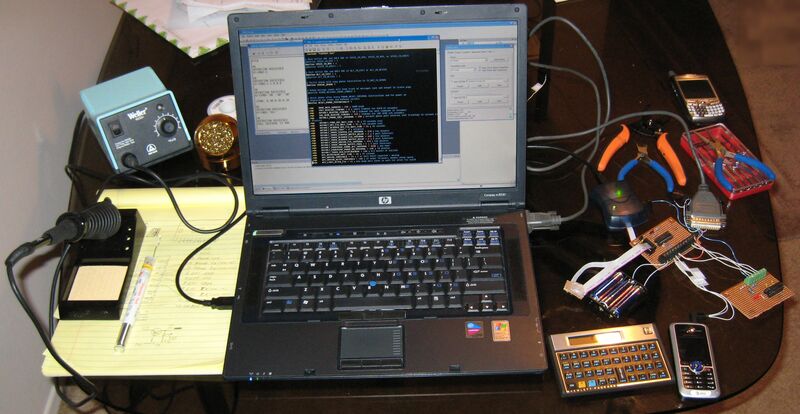 The Tracker software can be modified to sense or control a variety of devices. You can easily add commands to turn output lines on and off, read input lines, measure voltages with the ADC, etc. If you need more I/O, the program could be ported to the ATTINY86 or ATMEGA88 devices.